The other side of the coffee cup is printed with a portico-ed country house set in extensive grounds. This appears to be Claremont House. Considering how frequently L'Amour is found on Worcester porcelain, it is surprising that it was not used more extensively by the Liverpool porcelain factories. 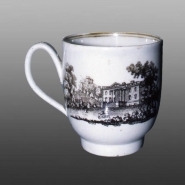 The version seen on this coffee cup, attributed to John Pennington, does not appear to be in the style associated with the Sadler and Green decorating shop and the printing was perhaps carried out at John's factory. A different version of L'Amour is known on Philip Christian's porcelain.